Puerto Rico experienced it. 150 mile an hour winds. Rain measured in feet rather than inches — two and half feet of it in one day! Almost the entire island without power for almost a year. And a death toll that made it one of the most deadly natural disasters in U.S. history. 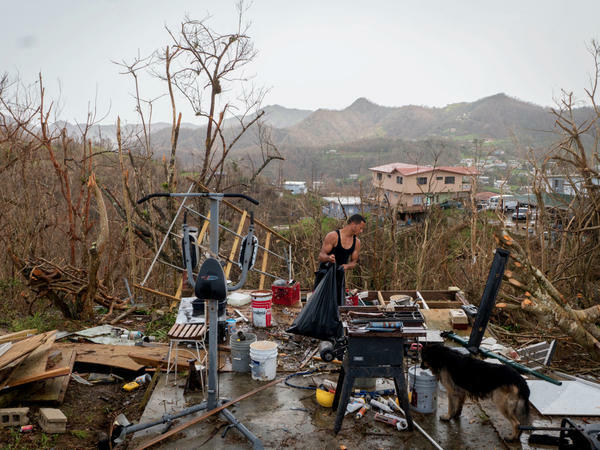 In the year since Hurricane Maria cut through Puerto Rico on Sept. 20, 2017, there has been plenty of news about the immediate aftermath and recovery that has stretched to a year and will apparently continue. In this week's Alt.Latino episode, we will take a look back through the eyes and ears of NPR journalists as they reported the day, exactly one year ago, that Maria made landfall then we'll hear reports from the first NPR journalists to arrive just days after the storm ravaged the entire island. We'll revisit reports of an unbearable debt crisis, the antiquated power grid and gross political ambition and unreliability were accomplices to the natural disaster. And it was all covered with the insight and investigative gravitas that NPR News is known for. It's all here explained by colleague Luis Clemens, who was the principal editor on the story. He sent the crews, established a running factual dialog and watched things from a bird's eye view to offer and angle to the reporters and producers that other news outlets may have missed. We also revisit an interview with Broadway star Lin-Manuel Miranda in which he talks about how his reaction to the devastation of his ancestral home led him to write a song and enlist a who's who of Latin music stars to help raise funds for the island. Hurricanes Irma and Maria not only caused massive physical destruction, but they also opened up old wounds that came from internal squabbling over the statehood issue on the island. Those conversations must be had and NPR has covered that as well. President Trump's recent public dispute of the revised death toll is a stark reflection of the political fall out from the storm in a White House seemingly self-absorbed and unable to show empathy. But as we hear in the final stories in this week's show, the resilience of the Boricua spirit is the main ingredient of the story of survival and looking toward the future for a better Puerto Rico.